Introduction Chronic inflammatory diseases (CIDs) are frequently treated with biological medications, specifically tumour necrosis factor inhibitors (TNFi)). These medications inhibit the pro-inflammatory molecule TNF alpha, which has been strongly implicated in the aetiology of these diseases. Up to one-third of patients do not, however, respond to biologics, and lifestyle factors are assumed to affect treatment outcomes. Little is known about the effects of dietary lifestyle as a prognostic factor that may enable personalised medicine. The primary outcome of this multidisciplinary collaborative study will be to identify dietary lifestyle factors that support optimal treatment outcomes. Methods and analysis This prospective cohort study will enrol 320 patients with CID who are prescribed a TNFi between June 2017 and March 2019. Included among the patients with CID will be patients with inflammatory bowel disease (Crohn’s disease and ulcerative colitis), rheumatic disorders (rheumatoid arthritis, axial spondyloarthritis, psoriatic arthritis), inflammatory skin diseases (psoriasis, hidradenitis suppurativa) and non-infectious uveitis. At baseline (pretreatment), patient characteristics will be assessed using patient-reported outcome measures, clinical assessments of disease activity, quality of life and lifestyle, in addition to registry data on comorbidity and concomitant medication(s). In accordance with current Danish standards, follow-up will be conducted 14–16 weeks after treatment initiation. For each disease, evaluation of successful treatment response will be based on established primary and secondary endpoints, including disease-specific core outcome sets. The major outcome of the analyses will be to detect variability in treatment effectiveness between patients with different lifestyle characteristics. Ethics and dissemination The principle goal of this project is to improve the quality of life of patients suffering from CID by providing evidence to support dietary and other lifestyle recommendations that may improve clinical outcomes. The study is approved by the Ethics Committee (S-20160124) and the Danish Data Protecting Agency (2008-58-035). Study findings will be disseminated through peer-reviewed journals, patient associations and presentations at international conferences. Trial registration number NCT03173144; Pre-results. This study includes a number of diseases treated with biologics, targeting the pro-inflammatory cytokine tumour necrosis factor alpha. All evaluations will be performed as part of a prospectively designed cohort study using established disease-specific scoring systems. As comparisons between diseases are limited by disease-specific scoring systems, additional response criteria (eg, quality of life and disability) will be used for analysis. In light of the notable impact that environment factors play in disease development, which is further supported by the increasing incidence of these disease,6 11 it stands to reason that modifying environment factors such as lifestyle may influence treatment response. Accordingly, quite a few patients ask their healthcare professionals for lifestyle recommendations that can influence the effectiveness of treatment, and in particular the outcomes achieved with TNFi. More recently, lifestyle factors, as they relate to TNFi therapy among patients with CID, were identified as an area for further investigation.40 To explore different hypotheses, we included studies that may be subject to recall bias or bias introduced by lifestyle changes due to the disease itself, for example, smoking, physical activities and intake of Western-style diet.40 After reviewing these potential hypotheses, we proposed a model, whereby a diet high in meat and low in fibres may impact inflammation and TNFi treatment37 (figure 1). Hypothesis for effects of diet in relation to treatment effect. (Left) Low levels of fibre intake may promote microbial metabolism of mucus as the main energy source.37 75 76 This will lead to decrease of the mucus layer. Further, degradation of mucus releases free sulfate, which would then become available for use by sulfate-reducing bacteria (eg, Bilophila wadsworthia) for microbial produced hydrogen sulfide.77 In addition, high intake of food containing organic sulfur and sulfate additives, such as meat and processed meat, may increase the amount of sulfate for microbial produced hydrogen sulfide.78 79 The resultant hydrogen sulfide from low intake of fibre and high intake of meat may reduce the disulfide bonds in the mucus network rendering the mucus layer penetrable to, for example, bacteria.77 80 Then, MAMPs from microbes or contained in the diet may reach the epithelium and activate the pattern recognition receptors such as TLRs on the enterocytes (IEC) and next activate NFkB, type I interferon and other inflammatory pathways. This leads to production of pro-inflammatory (TNF, IL-1β, IL-6, IFN, IL-17, etc), and anti-inflammatory (primarily IL-10) cytokines and chemokines that will next activate innate lymphocytic cells and other immune cells and the immune system in general.81 82 There is some support for such a mechanism in chronic inflammatory disease, including findings of high amounts of sulfate-reducing bacteria in patients with UC77 83; an association between the highest tertile of carbohydrate-restricted diet and RA, in a nested case–control study among 386 individuals who developed RA and 1886 matched controls from the Swedish Västerbotten Intervention Program cohort with prospectively sampled dietary survey84; association of high-fibre intake with low risk of Crohn’s disease among 170 776 participants from the prospective Nurses’ Health Study I23; association of high intake of red meat and total protein and risk of developing inflammatory polyarthritis in the population-based prospective cohort of 25 630 participants from the European Prospective Investigation of Cancer in Norfolk.35 Finally, a prospective study of 191 patients with UC in remission found that high consumption of meat, particularly red and processed meat, protein and alcohol was associated with risk of relapse, and that high sulfur or sulfate intakes may offer an explanation for the observed findings.85 Additionally, support of the notation that diet may affect systemic immune response is provided by the finding that intake of low glycaemic index diet was found to lower secretion of TNF and IL-6 from stimulated peripheral blood mononuclear cells from obese humans.86 (Right) Intake of high fibre and low meat may promote an effective mucosal barrier and support the effects of outcome after drug targeting the pro-inflammatory molecule TNF (TNF inhibitors). 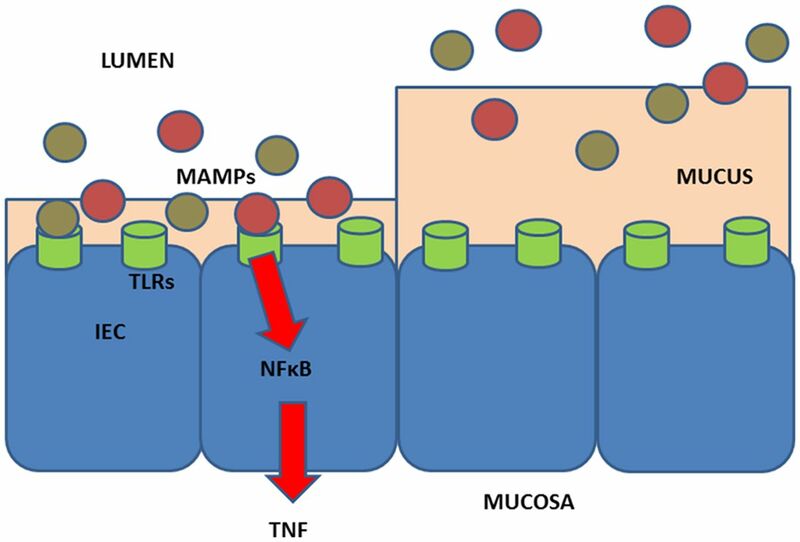 Intake of soluble plant fibre has been found to block bacterial adhesion to gut enterocytes in animal and cell studies.87 The genetic architecture of the individual may also impact the influence of lifestyle factors.15 Hence, to provide lifestyle recommendations, we need to understand the effects of lifestyle on the immune system and how lifestyle may improve the therapeutic outcome and reduce the need of medical treatment in the individual person. Information on diet and non-diet lifestyle exposures may be collected by using, for example, questionnaires and lifestyle-associated biomarkers or a combination of these methods.88–90 Evidence-based biomarkers for lifestyle assessment are scarce91–111 and mostly used for studies on healthy individuals.112–115 IEC, intestinal epithelial cells; IL, interleukin; MAMPS, microbial-associated molecular patterns; NFkB, nuclear factor kappa B; RA, rheumatoid arthritis; TLR, Toll-like receptors; TNF, tumour necrosis factor; UC, ulcerative colitis. Based on previous evidence, we set out to prospectively identify dietary factors that support optimal TNFi treatment outcomes, with the ultimate aim of improving the quality of life of patients with CID. The primary aim of this prospective cohort study is to investigate whether treatment outcomes in patients with CID vary with dietary differences. The main hypothesis is that ‘Diets high in fibre AND low in red and processed meat are associated with improved treatment outcomes’. Secondary aims are whether and to what extent lifestyle-associated biomarkers have prognostic value for differentiating responders from non-responders based on both disease-specific and generic treatment outcomes. 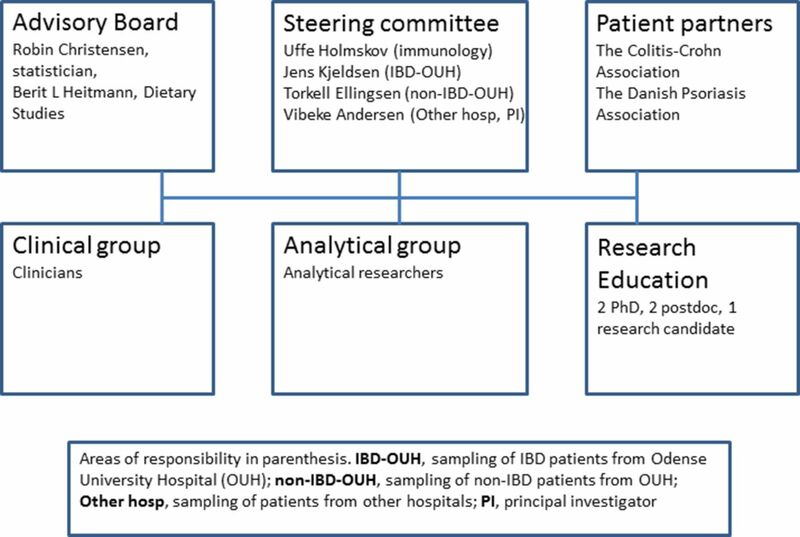 This multicentre study reflects a collaboration between the following centres: (1) Department of Gastroenterology and Hepatology, Aalborg University Hospital; (2) Department of Hepatology and Gastroenterology, Aarhus University Hospital; (3) Diagnostic Centre, Silkeborg Regional Hospital; (4) Department of Internal Medicine, Herning Regional Hospital; (5) Department of Gastroenterology, Herlev Hospital; (6) Organ Centre, Hospital of Southern Jutland; (7) Department of Gastroenterology, Hospital of South West Jutland; (8) Department of Medical Gastroenterology, Department of Rheumatology, Department of Dermatology and Allergy Centre and Department of Ophthalmology, Odense University Hospital. Study enrolment will take place between 15 June 2017 and 31 March 2019 or until the study has enrolled a minimum of 100 patients with IBD, 100 patients with RA and 120 patients with axSpA, PsA, PsO, HS and NiU. Inclusion criteria: patients ≥18 years with CID who are beginning TNFi therapy, who have not previously received TNFi treatment and who are able to read and understand Danish. Exclusion criteria: patients who have previously received a biological treatment and patients who by virtue of illiteracy or cognitive impairment are unable to complete the questionnaire. Major secondary outcomes, also to be measured 14–16 weeks after treatment initiation, include disease-specific outcome measures that cover core outcome sets, the generic health-related quality of life (HRQoL) and disability at endpoint. Below are a list of disease-specific secondary outcomes. CD: Selecting Therapeutic Targets in Inflammatory Bowel Disease (STRIDE; abdominal pain, diarrhoea, altered bowel habit, SES-CD (presence of ulcers, ulcerated surface, affected surface, presence of narrowing, number of affected segments), alterations of cross-sectional imaging (MR, CT, ultrasound) (only when endoscopy cannot adequately evaluate inflammation)), HBI (general well-being, abdominal pain, number of liquid stools per day, abdominal mass, extraintestinal manifestations (abscess, fistulas, fissures, arthralgia, uveitis, erythema nodosum, pyoderma gangrenosum, mouth ulcers)), physician global assessment, number of draining fistulas, corticosteroid-free remission, concomitant medication. UC: STRIDE (rectal bleeding, altered bowel habit, endoscopic remission (Mayo endoscopic subscore of 0–1)), Mayo Clinical Score (Mayo endoscopic subscore, stools, rectal bleeding, physician global assessment), Mayo ‘normal mucosal appearance’, Mayo clinical response, Simple Clinical Colitis Activity Index (bowel frequency (day), bowel frequency (night), urgency of defecation, blood in stool, general well-being, extracolonic features), physician global assessment, corticosteroid-free remission, concomitant medication. RA: Tender joints, swollen joints, pain, physician global assessment, patient global assessment, Health Assessment Questionnaire (HAQ), C reactive protein (CRP), Disease Activity Score (DAS)28-CRP, Simplified Disease Activity Index (SDAI). Axial spondyloarthropathy: Bath Ankylosing Spondylitis Metrology Index (BASMI), Bath Ankylosing Spondylitis Functional Index (BASFI), Bath Ankylosing Spondylitis DAI, total score for back pain, physician global assessment, patient global assessment, CRP. Psoriatic arthritis: tender joints, swollen joints, psoriatic arthritis pain, physician global assessment, patient global assessment, HAQ-DI, CRP, DAS28-CRP, SDAI, PASI. Psoriasis: PASI, physician global assessment, patient global assessment, psoriatic arthritis pain, Dermatology Life Quality Index total score. Hidradenitis suppurativa: percentage of participants who achieve abscess and inflammatory nodule (AN) count of 0, 1 and 2, respectively, patient’s global assessment of skin pain, modified Sartorius score. Non-infectious uveitis: new active, inflammatory chorioretinal or retinal vascular lesions relative to baseline, inability to achieve ≤0.5+ or a two-step increase relative to the best state achieved at all visits in anterior chamber cell grade or vitreous haze grade, worsening of best-corrected visual acuity by ≥15 letters relative to best state achieved. The upper tertile of the sample (33.3% of the total sample), based on the ratio of fibre to meat intake, is associated with better treatment outcomes. The lower tertile of the sample (33.3% of the total sample) with respect to intake of red and processed meat and the upper tertile of the sample (33.3% of the total sample) with respect to intake of dietary fibres are independently associated with better treatment outcomes, and a potential interaction between them may further improve treatment outcomes. pretreatment levels of inflammatory molecules. No patient risks are foreseen as a direct result of this project. Clinicians will treat enrolled patients in the same fashion as non-enrolled patients. As a consequence, no data monitoring committee will be established. Prognostic factor research was developed to aid healthcare providers in estimating the probability or risk that a specific event will occur in the future. Hence, it has the potential to inform clinical decision-making.56 Conceptually, a good prognostic model is one that functions for patients other than those from whom the data was derived.57 Our intention is to use data obtained from this rigorously designed, prospective cohort study to explore our ability to predict clinical response across specific CID conditions (Y=primary endpoint) and to explore whether diets high in fibre AND low in red and processed meat (X=assessed at baseline) are an informative prognostic factor. Per default, the statistical models will include the specific CID condition and the clinical centre as fixed effects. Specific details will be part of the final statistical analysis plan (SAP). In terms of transparency, when reporting the multivariable models, the study will adhere to guidelines from the ‘Transparent Reporting of a multivariable prediction model for Individual Prognosis or Diagnosis’. Deciding sample size is a well-known difficulty with exploratory prognostic factor research studies. To obtain an adequate number of outcome events, we apply ‘the rule of thumb’, whereby 10 outcomes are needed for each independent variable. We plan to enrol 320 patients in total and we anticipate that 50% of these will experience a clinical response during the 14–16 weeks period after TNFi initiation.1 With this in mind, and anticipating that we will see at least 160 events (ie, clinical response among the 320 patients), the study is sufficiently powered to explore the impact of as many as 16 independent variables including condition and clinical centre. Since using the ‘rule of thumb’ method to justify sample size is a debated practice, we went one step further and estimated the statistical power to detect differences between two dietary groups. For the contrast between groups and for a comparison of two independent binomial proportions (those with high-fibre and low-meat intake vs other) using Pearson’s χ2 statistic, with a χ2 approximation, with a two-sided significance level of 0.05 (P<0.05), a total sample size of 318—assuming an ‘allocation ratio’ of 1 to 2 (one-third)—has an approximate power of 0.924 (ie, >90% statistical power) if the anticipated proportions responding are 60% and 40%, respectively. Statistical programming will be done using the software SAS V.9.4(SAS Institute Inc., Cary, NC, USA), STATA or R, with transparent reporting of the source code used to analyse the data. Computational details will be available in the prespecified SAP. These will be finalised before data collection is complete. Our primary analysis set will be based on observations available at the time of study closure. In other words, we will consider ‘Data as observed’ to be our primary resource for statistical inference. However, for the purpose of sensitivity, multiple sensitivity analyses will be performed to assess the robustness of the primary analyses, including analyses based on the ‘Non-responder-imputation’ and multiple-imputation analyses, which are based on model-based approaches for missing data (these details will be available in the final SAP). A simplistic ‘null responder imputation’ would represent a conservative base case and is likely valid even if data is ‘missing not at random’,58 as it assumes, and implies that patients have not improved or have worsened after entering the study. No interim analyses will be performed. All reported P values will be two sided, and by default, these will not be adjusted for multiple comparisons. However, due to potential issues of multiplicity, as multiple statistical tests will be performed in the study, we will interpret ‘statistically significant’ findings in the context of whether the 95% CI excludes outcomes that could be perceived as clinically important. We will use the following consistent language to describe effects that might appear as chance findings: “The prognostic factor appears to have little or no effect on the clinical outcome if the point estimate or the boundaries of the 95% CI lies between 0.80 and 1.25”. Thus, despite an apparently statistically significant finding (P<0.05), a relative point estimate within the range of 0.80 and 1.25 will not be considered a clinically meaningful effect. The Food Frequency Questionnaire (FFQ) we use in the present study has been widely used in prospective cohort studies, including in European prospective investigations in the fields of oncology and chronic diseases.59 60 It has been extensively used and evaluated in the Danish population, and results from different methods demonstrate consistency.61 62 However, the FFQ is not without limits, in particular with respect to the lack of information on portion sizes.63 64 We, therefore, modified the FFQ to capture information on portion size.63 A second potential limitation relates to comprehensive questionnaire completion. However, in a pilot study of 10 hospital patients (50–70 years of age) the FFQ was completed within 40–50 min and no complaints were reported. The imprecision of the FFQ will lead to large CIs. The result will most likely lead to null results (rather than type 2 errors). The disease groups are expected to vary in several aspects such as age, gender and body mass index. We will, however, be unable to determine the potential effect of selective diet reporting on responders and non-responders.65 On the other hand, studies have suggested that dietary patterns are relatively stable among adults in the Danish population.66 Due to study design and the limited number of participants, this study may not capture every lifestyle difference between responders and non-responders. Similarly, this study has only limited power to detect gene–environment interactions. To avoid potential type 2 errors, it is important that the results are replicated in other well-characterised patient populations using prospectively sampled dietary information. To further evaluate the robustness of the results, study results would preferably be replicated in cohorts from other countries. The study team is organised into three significant groups: a clinical research group (CRG), an analytical research group (ARG) (figure 2) and a steering committee (SC). The CRG includes specialists from gastroenterology, rheumatology, dermatology and ophthalmology who will be implicated in the clinical care and assessment of study participants. The ARG will be responsible for performing laboratory analyses on the collected biological material. Finally, the SC—whose members include Professor Uffe Holmskov, Professor Jens Kjeldsen, Professor Torkell Ellingsen and Professor Vibeke Andersen—are responsible for planning and organising the study within the appropriate legal framework, facilitating meetings for the three study groups and for scientific follow-up. The group as a whole, including clinicians and analysts, is responsible for the scientific results and budget. Organisation and patient research partners. IBD, inflammatory bowel disease. Collaboration between patients and health professionals on research projects is a relatively new phenomenon.67–69 The involvement of patients in research (patient research partners (PRPs)) will ideally will give a stronger voice to patients’ views on research, specifically with respect to research priorities. Furthermore, individual patients and patient organisations can contribute to research study design, preparing educational material, discussing results, disseminating results and recruiting study participants. Recommendations on incorporating PRPs into research study processes suggest that they should be provided with relevant support and education. With this initiative, we were keen to gain experience with PRPs. Thus, this project was built with input from the Danish Colitis-Crohn’s Association, represented by its director Charlotte Lindgaard Nielsen, the Danish Psoriasis Association, represented by its director Lars Werner and three individual patients with RA from one of the participating clinical departments. The SC will hold telephone conferences every 2–4 weeks, but more often when necessary, and face-to-face meetings 3–4 times per year. Among participants, the SC will organise telephone conferences every 2–4 weeks, again more often when necessary, and face-to-face meetings at the time of enrolment and every year thereafter until the conclusion of the study. The use of prognosis research evidence at multiple stages is central to the process of translational research, with the ultimate goal of improving patient outcomes. Prognosis research includes various aspects of importance to healthcare professionals, enabling them to guide individual patients in terms of shared decision-making via overall prognosis, knowledge on important prognostic factors or models and subsequently (from randomised trial evidence) stratified medicine.56 70–72 We anticipate that BELIEVE study will reveal prognostic factors of importance, including whether the diet of the patient is likely to interfere with the outcome of being prescribed a TNFi treatment. Hopefully, by combining various phenotype and genotype aspects into the prognostic models, BELIEVE study will add value to the long-term goal of achieving ‘personalised medicine’. The target journal for the primary outcome will be a general medical journal directed at family physicians. Family physicians see patients with CID across the entire spectrum of disease. Moreover, lifestyle recommendations are an important element of general practice. Hence, although family physicians are not necessarily the primary decision-makers with respect to treatment of patients with CID, a role more ably assumed by specialists, they have considerable influence on lifestyle decisions for patients with CID. Subsequently, other hypotheses will be analysed and manuscripts prepared (independent of findings), with the intention of submitting additional articles to specialised journals in the areas of nutrition, immunology, gastroenterology, rheumatology, dermatology and ophthalmology. Authorship confers credit and has important academic, social and financial implications and therefore any authorship on manuscripts coming from BELIEVE study is associated with responsibility and accountability for the published work. Thus, we intend to follow the recommendations of the International Committee of Medical Journal Editors (ICMJE) to ensure that contributors who have made substantive intellectual contributions to a paper are given credit as authors, but also that contributors credited as authors understand their role in taking responsibility and being accountable for the published work. The ICMJE criteria for authorship was designed to distinguish authors from other contributors based on the following four criteria: (1) substantial contributions to the conception or design of the work; or the acquisition, analysis or interpretation of data for the work; (2) drafting the work or revising it critically for important intellectual content; (3) final approval of the version to be published and (4) agreement to be accountable for all aspects of the work in ensuring that questions related to the accuracy or integrity of any part of the work are appropriately investigated and resolved. In addition to the scientific reporting of results, major findings with translational implications will be communicated to health professionals, patient organisations, public health policy-makers and to the general public through various media and news activities. Lina A Knudsen and Mark Unger are thanked for English proofreading. Knight J , et al. RADS. Rådet for Anvendelse af Dyr Sygehusmedicin. 2017 http://www.rads.dk/ (accessed 20.2.2017). OPEN. 2017 http://www.sdu.dk/en/Om_SDU/Institutter_centre/Klinisk_institut/Forskning/Forskningsenheder/open.aspx (accessed 20 Febraury 2017).
. Intake of whole grains and vegetables determines the plasma enterolactone concentration of Danish women. J Nutr 2004;134:2691–7.
. Associations between microalbuminuria and animal foods, plant foods, and dietary patterns in the multiethnic study of atherosclerosis. Am J Clin Nutr 2008;87:1825–36.
. Biospecimen reporting for improved study quality (BRISQ). JProteomeRes 2011;10:3429–38. Contributors VA, BLH and RC wrote the first draft. All other authors, KWA, OHN, SBS, MJ, AB, LH, JG, JW, HG, UF, JAV, SGK, JF, SAGRM, TK, JB, JF, JFD, ABB, GLS, ST, NJF, IB, TBB, AS, EBS, AF, DE, PR, JR, MB, LW, CLN, HLM, ABN, TK, JK and UH contributed to the conception and design of the study. All authors accepted the final submitted version. Funding This project is part of a project that has received funding from the European Union’s Horizon 2020 Research and Innovation Programme under grant agreement No 733100” (P Rosenstiel, A Franke, J Raes, V Andersen). Funding has furthermore been received from Odense Patient data Explorative Network (OPEN) (OP-332, V Andersen), “Knudog Edith Eriksen’s Mindefond” (V Andersen), Region of Southern Denmark (V Andersen), University of Southern Denmark (V Andersen, U Holmskov). The Parker Institute, Bispebjerg and Frederiksberg Hospital (R Christensen, B L Heitmann) are supported by a core grant from the Oak Foundation (OCAY-13-309). Competing interests All authors declare no conflict of interest. However, the following authors declare: B. Heitmann has received funding from ‘MatPrat’, the information office for Norwegian egg and meat; L. Hvid is on the advisory board for Abbvie A/S; J. Fallingborg is on the advisory boards for AbbVie A/S, MSD Denmark, Takeda Pharma A/S, and Ferring Pharmaceuticals A/S; V. Andersen receives compensation for consultancy and for being a member of the advisory board for MSD Denmark (Merck) and Janssen A/S. The funding sponsors had no role in the design of the study; in the collection, analysis, or interpretation of data; in the writing of the manuscript, or in the decision to publish the results. Ethics approval Written informed consent will be obtained from participants before participation in the study. The project has been approved by The Regional Scientific Ethical Committee (S-20160124) and the Danish Data Protection Agency (2008-58-035). The procedures followed are in accordance with the ethical standards of the responsible committee on human experimentation (institutional and national) and with the Helsinki Declaration of 1975 with later amendments.